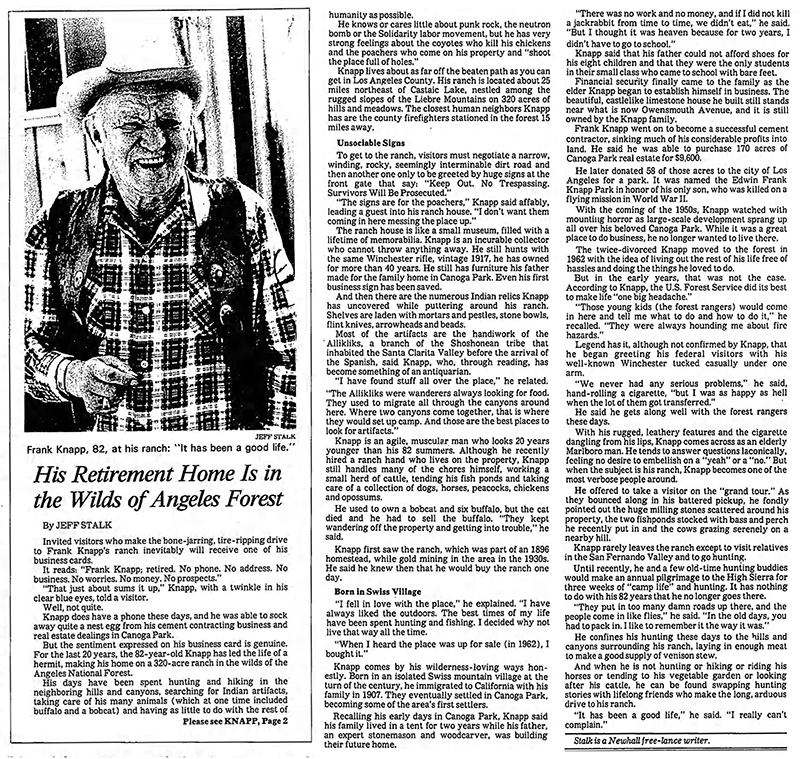 SCVHistory.com | Ridge Route | Frank Knapp Lives Hermit Existence in Wilds of Angeles Forest, 4-25-1983. Frank Knapp Lives Hermit Existence in Wilds of Angeles Forest. Los Angeles Times | April 25, 1983. Known as the Knapp Ranch, the subject's property was located southeast of Sandberg off of the Ridge Route at N34.687632 W118.663825. Frank Knapp bought the ranch in 1962 and mentions visiting it as early as the 1930s. At that time, it was the Kelly Ranch. We don't know Kelly's identity, and neither does Ridge Route historian Harrison Scott (see Harrison Scott 2002:131). Ridge Route Communities historian Bonnie Ketterl Kane is silent on the matter. The only Kelly we're aware of in the vicinity at the time suggested by Scott (pre-1900) is Allen Kelly, who was hunting grizzly bears in 1889. But we find no record of a homestead filed under the name Kelly or Kelley at that location. In the 1950s, the person living at the Kelly Ranch was Annie Rose Briggs, daughter of Castaic homesteader William B. Rose (whose property was in today's town of Castaic). We know this from the daughter and son-in-law of Glenn McKinney, who performed excavation work on Annie's gold mine at the ranch (which they knew as the Kelly Ranch) beginning in 1951 (pers. comm. 2017). Also: Knapp refers to the Tataviam Indians as "Alliklik," which is how they were known at the time. Archaeologists studying Harrington's notes determined in 1974 that the local people called themselves Tataviam (or at least, the neighboring Kitanemuk called them that), but the lay public, including news reporters, didn't know it until the 1990s. They also didn't know "Alliklik" was actually a derogatory Chumash term for the local indigenous population. Knapp would have meant no disrespect by it. Based on physical evidence, the Kelly/Knapp Ranch is a good candidate for the pre-1811 Tataviam village of Cuecchao. His Retirement Home is in the Wilds of Angeles Forest. By Jeff Stalk | Los Angeles times | April 25, 1983. Invited visitors who make the bone-jarring, tire-ripping drive to Frank Knapp's ranch inevitably will receive one of his business cards. It reads: "Frank Knapp; retired. No phone. No address. No business. No worries. No money. No prospects." "That just about sums it up," Knapp, with a twinkle in his clear blue eyes, told a visitor. Knapp does have a phone these days, and he was able to sock away quite a nest egg from his cement contracting business and real estate dealings in Canoga Park. But the sentiment expressed on his business card is genuine. For the last 20 years, the 82-year-old Knapp has led the life of a hermit, making his home on a 320-acre ranch in the wilds of the Angeles National Forest. His days have been spent hunting and hiking in the neighboring hills and canyons, searching for Indian artifacts, taking care of his many animals (which at one time included buffalo and a bobcat) and having as little to do with the rest of humanity as possible. He knows or cares little about punk rock, the neutron bomb or the Solidarity labor movement, but he has very strong feelings about the coyotes who kill his chickens and the poachers who come on his property and "shoot the place full of holes." Knapp lives about as far off the beaten path as you can get in Los Angeles County. His ranch is located about 25 miles northeast of Castaic Lake, nestled among the rugged slopes of the Liebre Mountains on 320 acres of hills and meadows. The closest human neighbors Knapp has are the county firefighters stationed in the forest 15 miles away. To get to the ranch, visitors must negotiate a narrow, winding, rocky, seemingly interminable dirt road and then another one only to be greeted by huge signs at the front gate that say: "Keep Out. No Trespassing. Survivors Will Be Prosecuted." "The signs are for the poachers," Knapp said affably, leading a guest into his ranch house. "I don't want them coming in here messing the place up." The ranch house is like a small museum, filled with a lifetime of memorabilia. Knapp is an incurable collector who cannot throw anything away. He still hunts with the same Winchester rifle, vintage 1917, he has owned for more than 40 years. He still has furniture his father made for the family home in Canoga Park. Even his first business sign has been saved. And then there are the numerous Indian relics Knapp has uncovered while puttering around his ranch. Shelves are laden with mortars and pestles, stone bowls, flint knives, arrowheads and beads. Most of the artifacts are the handiwork of the Allikliks, a branch of the Shoshonean tribe that inhabited the Santa Clarita Valley before the arrival of the Spanish, said Knapp, who, through reading, has become something of an antiquarian. "I have found stuff all over the place," he related. "The Allikliks were wanderers always looking for food. They used to migrate all through the canyons around here. Where two canyons come together, that is where they would set up camp. And those are the best places to look for artifacts." Knapp is an agile, muscular man who looks 20 years younger than his 82 summers. Although he recently hired a ranch hand who lives on the property, Knapp still handles many of the chores himself, working a small herd of cattle, tending his fish ponds and taking care of a collection of dogs, horses, peacocks, chickens and opossums. He used to own a bobcat and six buffalo, but the cat died and he had to sell the buffalo. "They kept wandering off the property and getting into trouble," he said. Knapp first saw the ranch, which was part of an 1896 homestead, while gold mining in the area in the 1930s. He said he knew then that he would buy the ranch one day. "I fell in love with the place," he explained. "I have always liked the outdoors. The best times of my life have been spent hunting and fishing. I decided why not live that way all the time. "When I heard the place was up for sale (in 1962), I bought it." Knapp comes by his wilderness-loving ways honestly. Born in an isolated Swiss mountain village at the turn of the century, he immigrated to California with his family in 1907. They eventually settled in Canoga Park, becoming some of the area's first settlers. Recalling his early days in Canoga Park, Knapp said his family lived in a tent for two years while his father, an expert stonemason and woodcarver, was building their future home. "There was no work and no money, and if I did not kill a jackrabbit from time to time, we didn't eat," he said. "But I thought it was heaven because for two years, I didn't have to go to school." Knapp said that his father could not afford shoes for his eight children and that they were the only students in their small class who came to school with bare feet. Financial security finally came to the family as the elder Knapp began to establish himself in business. The beautiful, castlelike limestone house he built still stands near what is now Owensmouth Avenue, and it is still owned by the Knapp family. Frank Knapp went on to become a successful cement contractor, sinking much of his considerable profits into land. He said he was able to purchase 170 acres of Canoga Park real estate for $9,600. He later donated 58 of those acres to the city of Los Angeles for a park. It was named the Edwin Frank Knapp Park in honor of his only son, who was killed on a flying mission in World War II. With the coming of the 1950s, Knapp watched with mounting horror as large-scale development sprang up all over his beloved Canoga Park. While it was a great place to do business, he no longer wanted to live there. The twice-divorced Knapp moved to the forest in 1962 with the idea of living out the rest of his life free of hassles and doing the things he loved to do. But in the early years, that was not the case. According to Knapp, the U.S. Forest Service did its best to make life "one big headache." "Those young kids (the forest rangers) would come in here and tell me what to do and how to do it," he recalled. "They were always hounding me about fire hazards." Legend has it, although not confirmed by Knapp, that he began greeting his federal visitors with his well-known Winchester tucked casually under one arm. "We never had any serious problems," he said, hand-rolling a cigarette, "but I was as happy as hell when the lot of them got transferred." He said he gets along well with the forest rangers these days. With his rugged, leathery features and the cigarette dangling from his lips, Knapp comes across as an elderly Marlboro man. He tends to answer questions laconically, feeling no desire to embellish on a "yeah" or a "no." But when the subject is his ranch, Knapp becomes one of the most verbose people around. He offered to take a visitor on the "grand tour." As they bounced along in his battered pickup, he fondly pointed out the huge milling stones scattered around his property, the two fishponds stocked with bass and perch he recently put in and the cows grazing serenely on a nearby hill. Knapp rarely leaves the ranch except to visit relatives in the San Fernando Valley and to go hunting. Until recently, he and a few old-time hunting buddies would make an annual pilgrimage to the High Sierra for three weeks of "camp life" and hunting. It has nothing to do with his 82 years that he no longer goes there. "They put in too many damn roads up there, and the people come in like flies," he said. "In the old days, you had to pack in. I like to remember it the way it was." He confines his hunting these days to the hills and canyons surrounding his ranch, laying in enough meat to make a good supply of venison stew. And when he is not hunting or hiking or riding his horses or tending to his vegetable garden or looking after his cattle, he can be found swapping hunting stories with lifelong friends who make the long, arduous drive to his ranch. "It has been a good life," he said. "I really can't complain." Stalk is a Newhall freelance writer.